Want a big bang for your buck? 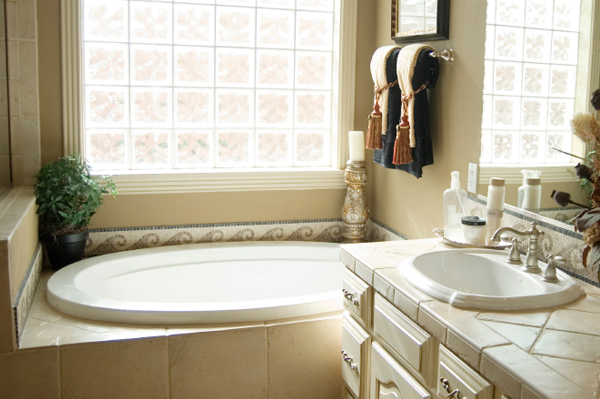 Remodelling a dated bathroom delivers great return on the money and time you invest! The bathroom is the only room in your house that everyone will visit sooner or later, so it makes a lot of sense to put it at the top of your list for home improvements. Not only will small improvements make the bathroom more attractive and useable, they will significantly improve the value of your home. Kitchen and bath remodels are acknowledged as the most frequently undertaken and most expensive work that homeowners can do and for good reason. The return on investment of these improvements can pay off big when you sell your home. Even small repairs and cosmetic updates are worth the time and effort. Leaky faucets, broken or outdated mirrors and cracked or stained bathtubs all need attention. Some to-dos can be handled quickly, and some items will need to go. Old, stained tubs can be refinished to look like new for a fraction of their replacement cost — and it changes the whole look of a bathroom to ditch the dated coloured fixtures for a crisp, clean white. There are kits that let the homeowner tackle this job themselves, or companies that specialise in ceramic fixture refinishes. Home handymen — and women — can manage to change out-dated fixtures. Just replacing the tired originals with a stylish brushed chrome faucet set in a more modern design will dress up the sink area. Want the savings to really register? Have a dual-flush toilet installed to replace the water-waster you currently have, add a low-flow shower head or switch to an on-demand water heater for your shower. You’ll see a noticable reduction in electricity and water usage that will be reflected on your utility bill and over time the savings will pay for the improvements you’ve made. It’s big bang for your buck when you add upscale elements and special finishes in a bathroom. Replace linoleum or vinyl floors with some luxury — heated bathroom floors keep a cold space comfy and are an excellent selling feature. The warming elements are placed below the tile and controlled with a switch. Homeowners can expect a return of between 65-75 per cent of investment on this type of major bathroom upgrade, and it certainly makes the space more liveable immediately! Consider marble or granite countertops. They’re beautiful and durable and the small stretch of material needed for most bathroom vanity areas makes them affordable. Before having a new counter installed, switch out the old basin for a molded sink, or add a striking vessel bowl. Keep it all looking fresh with a new coat of paint… colour can make the biggest difference. Don’t neglect the trim when painting as it’s often in need of a spruce up, too. Check the lighting and upgrade it with new sconces to complement other hardware or a slim modern fixture for improved visability. Mount new hardware to hold towels, including a heated towel warmer for some spa-like luxury. When guests ask for directions to the bathroom now, you’ll be proud to point the way!